We celebrated the winners of an Easter card designing competition for R.E Jones of Sale. There were so many lovely designs. 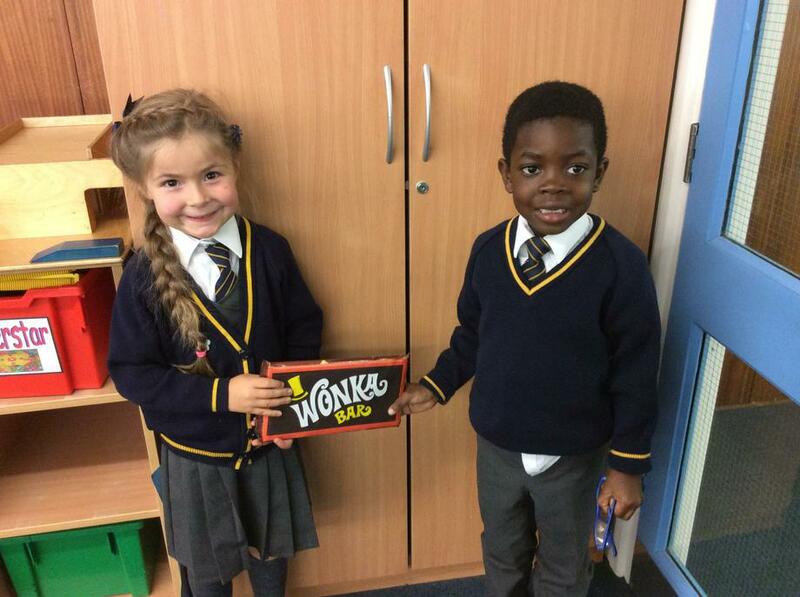 One of our Year 2 children was the lucky winnner! In assembly we thought about the many symbols of Easter and all the ways we celebrate Easter. We sang songs and talked about Easter Story! We even had an Easter egg raffle with Easter eggs donated from the PTA! As part of ‘Ashton Village In Bloom’ Year 1 have designed and decorated a planter that will go on display outside in the village this Spring. Isn’t it amazing! Year One had a great time constructing their pirates ships with the help of their grown ups. All of the ships were amazing, so full of creativity and excellent designs. What fun we had! The Year One children put on an amazing show on the stage about pirates visiting school. What brilliant singers and actors they were! Have a look at the photos from our show. 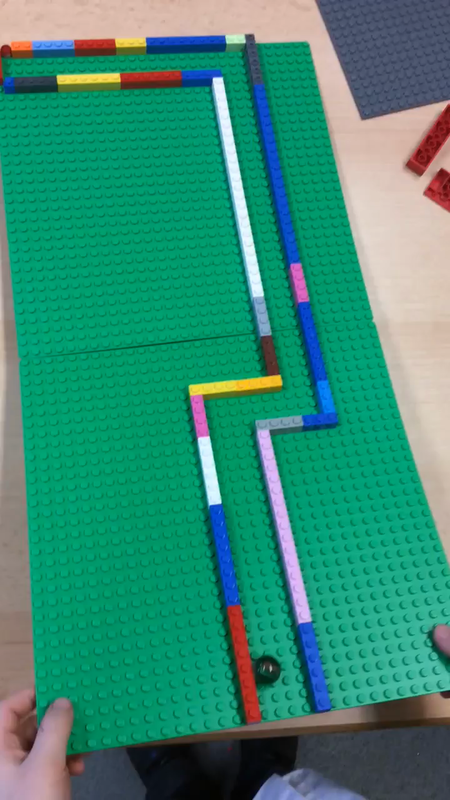 The children really enjoyed getting hands on in their Lego workshop this week. They had to be designers, problem solvers and engage their creativity. Have a look at the fun we had! We supported Red Nose Day today by coming into school in our red noses and red clothes. We had a special assembly that explained who Comic Relief raises for and how important it is. In assembly we looked at all the ways people all over the country had joined in and taken part in Red Nose Day to raise money. We joined in by sharing jokes in assembly and singing songs! We have had a wonderful time playing wheelchair rugby in Year One today. We had a visitor from Sale Sharks come to teach us how to play. Have a look at the fun we had! The children in Year 1 enjoyed sharing stories with their friends and older children from the juniors. Have a look at the fun we had! In Year One we have been celebrating each other’s heritage. As part of their homework, each child recorded the name of a special place that linked to their family and heritage. In class we added these hearts to a world map. The children loved learning about each other’s links across the world. In Year One we have been learning about the Chinese New Year traditions and celebrations. The children have written their own leaflets about Chinese New Year and we created our own Chinese New Year Wishing Tree. As part of the celebrations the children learned a traditional Chinese Folk dance from a specialist folk dance teacher. Today we met a GP, a bone surgeon, and their beautiful baby. As you can imagine, discussion with these three covered many aspects of our topic, ourselves. It seems we have many future medics. 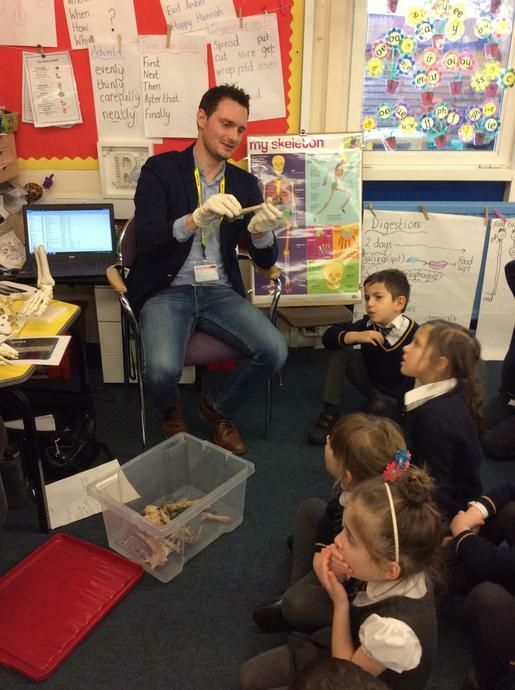 It was very fitting that we had a bone surgeon in our presence, as yesterday Year 1 found some bones in Forest School. How exciting! We were able to use models of the human skeleton to compare and identify various body parts of a fox. The bones were large so we conclude he had a long and happy life on our school field. We enjoyed seeing how doctors use all of their equipment to assess, check and diagnose, and will use this in our role play area. The children in Year 1 have really enjoyed learning about the human body. In class the children showed off their learning by drawing and labelling the key parts of the human body. It was great fun! 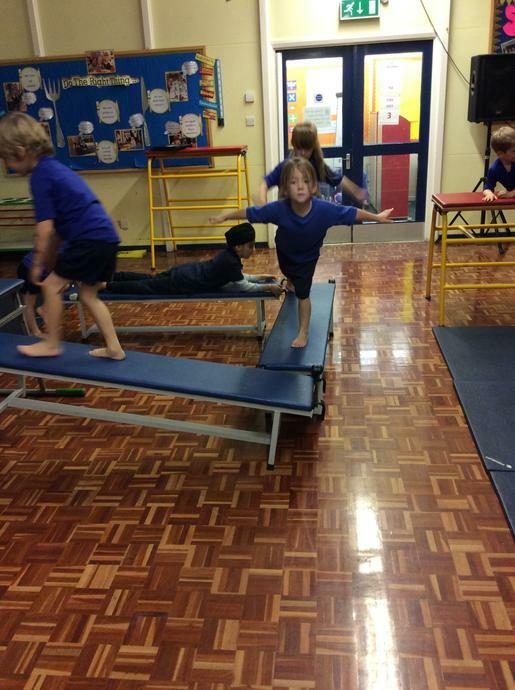 During the Autumn Term, the children amazed us with their gymnastics skills during teacher led lessons. They developed skills and completed routines to rival Team GB! 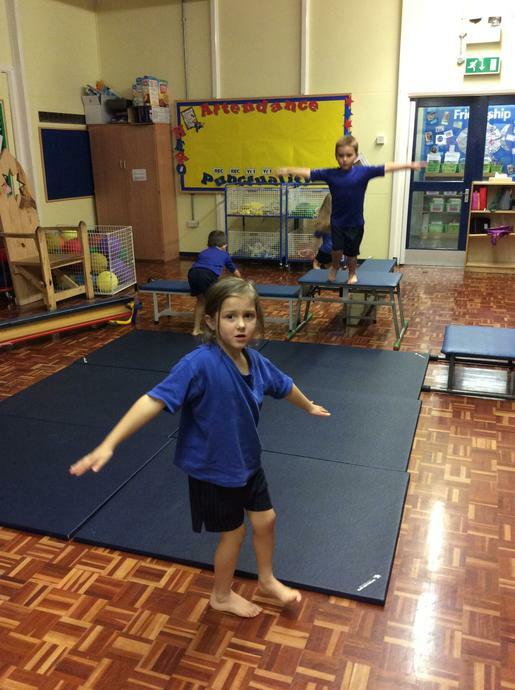 This term we are really excited as we are able to continue with gymnastics with our specialist teacher. 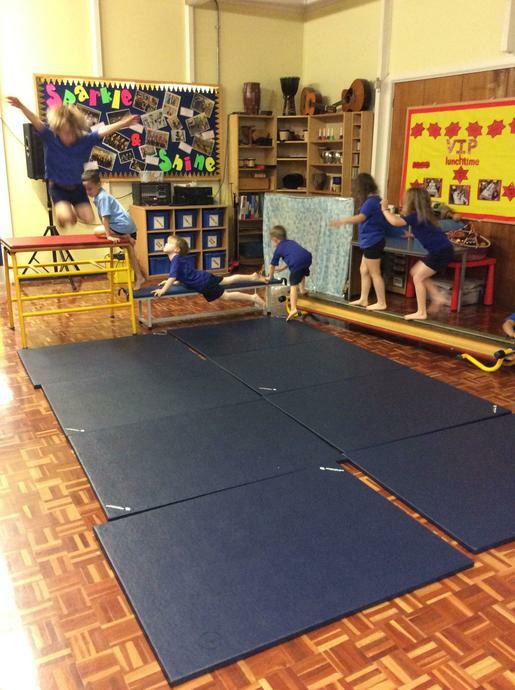 Our Beth Tweddle Gymnastics coach has started working with the children today, and will continue every Wednesday. In the meantime, here are a few pictures from the Autumn Term. Happy New Year! This term we will be learning all about ‘Ourselves’. The children have already started to think about what they would like to learn and we are making a whole class topic web to share our ideas. We will be learning more about senses, our bodies, growth, keeping healthy, and the professions related to these. We would love any parents who work in the medical profession to come in and talk to the children. Please let us know if you can help. The children are already enjoying role play in The Medical Centre, and scientific experiments to test our senses in isolation. We will also look at, and embrace, individual differences, heritage, and celebrating the ‘unique me’. It’s going to be a very busy topic, and lots of fun. The children put on a brilliant show in our Nativity 'Christmas With The Aliens'. The show was a massive hit and all of the children made us so proud. We had a brilliant party day in the last week as a reward for all our hard work. Below are some photos of the show and our party day! On Friday the 9th November we celebrated 100 Years since the end of World War One. 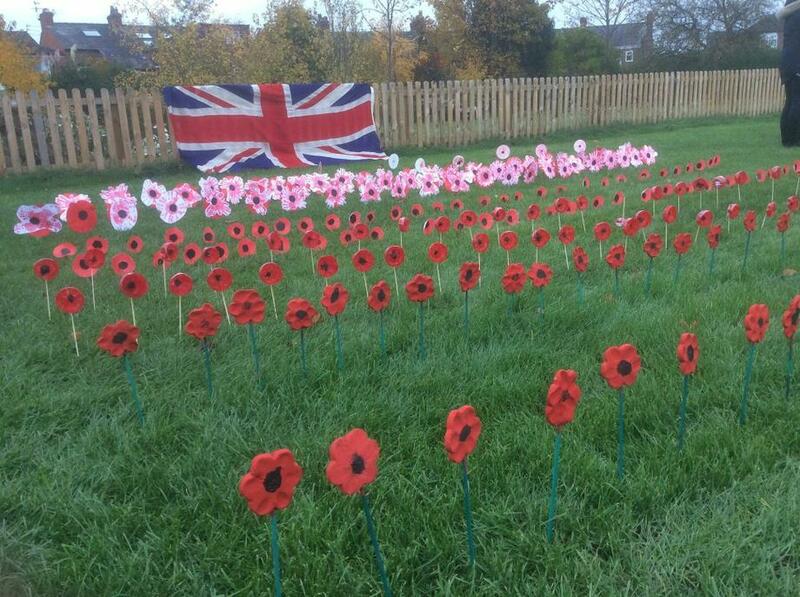 We all came into school with our poppy accessories and we had lots of fun celebrating.We created our own poppies and we planted them in the field to represent fallen soldiers. This was a very special experience for our children. We were also lucky enough to have a special visitor come into our class to talk about the work of the British Legion and to share with us some information about life the British Army. Below are some photos of that amazing day. As part of our STEM ( Science, Technology, Engineering and Maths) day the children in Year 1 learnt about rockets and we made our own rocket mice. In Year 1 we were investigating the best material to make a rocket. We made and tested our designs. It was all great fun! Line drawing with pencil and ink, completed with watercolour. This super artist has mixed up two different shades of purple to perfect her work. We have had a great first few weeks in Year 1. The children have got used to their new classroom and the Year 1 team. 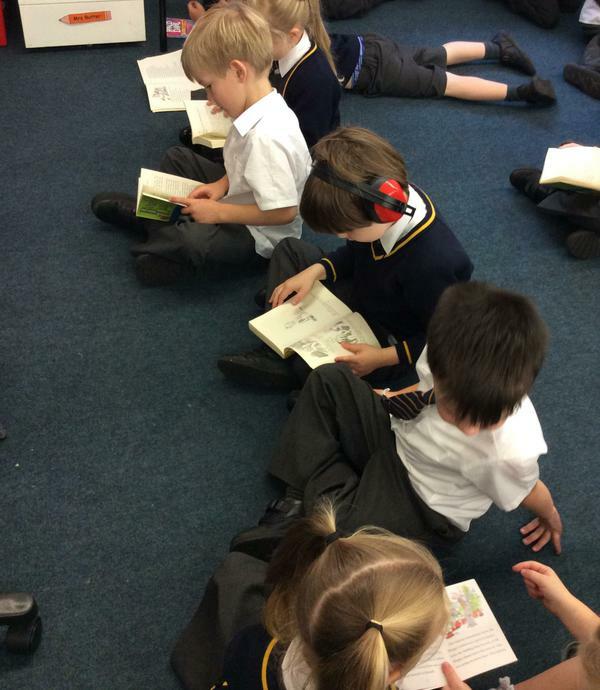 In English we have enjoyed reading stories by Julia Donaldson. 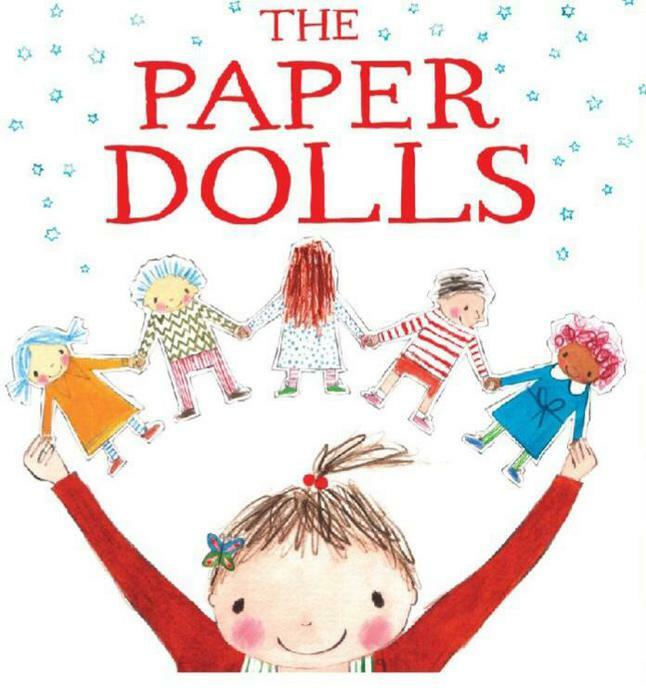 We read 'Paper Dolls' and in Art we created our own paper dolls to help us plan and write our own paper doll adventures. Here are some of our Year 1s enjoying Sharing a shell, by Julia Donaldson. Our topic for this term has been 'Plants and Animals'. We started this topic with the 'Year One Great Hyacinth Race'. The children were given hyacinth bulbs to take care of in groups. They had to water their plants daily and record the height of their plants for the race. The children were surprised when their hyacinths flowered in different colours at different rates. Later on in the term, we also grew water cress in different conditions and we planted seed potatoes. The children discovered that plants cannot grow without water. As well as learning about plants we also learned about animals. The children enjoyed learning about the life cycle of a frog. In Computing the children enjoyed creating flow charts and news reports about the life cycle of a frog. Year One also looked at animal classification. They discovered that there are 6 main groups that animals can be sorted into and these are; Mammals, Reptiles, Fish, Amphibians, Birds and Insects. The children designed and wrote their own information booklets about the different animal groups. At WINS we celebrated the Royal Wedding in style. In class we enjoyed learning about past Royal weddings and about members of the royal family. We also had a dress making area and the children helped to add embellishments and detail to the dress to make it perfect for Miss Markle. The whole school took a 'rock and roll dance class' to learn how to party in style. They children were amazing dancers and they danced all week. On the Friday, we had a whole street party. We started the day with an amazing assembly by Mrs Fairclough. In the afternoon we had a street party for the whole school in the playground. At the party, we had crisps, drinks and ice-cream. The party was full of smiles and dancing. During the first week back we have been learning all about Chinese New Year. In Year 1 we have been learning about the story of Chinese New Year and the ways in which Chinese New Year is celebrated. We enjoyed creating our own Chinese New Year wishing tree filled with wishes of good health, luck and happiness. 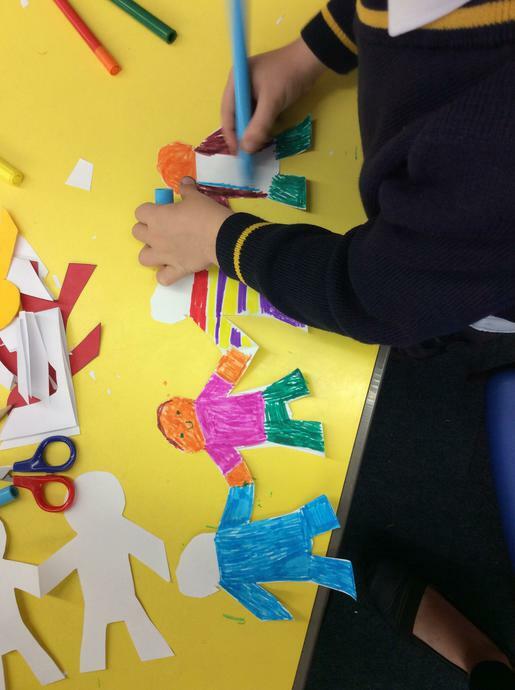 In our Art lessons we designed and created our own Chinese paper dragons and we used them to create a class dragon dance. We have also explored the Mandarin symbols for the numbers 1-10. Some children tried to create the symbols in our construction area. Have a look! Our topic for this half term has been "Ourselves". The children have really enjoyed learning about how our bodies work and how we can take care of them. We know that we have 5 senses and which parts of our body we use for each sense. We have learned about our food's journey through our digestive system and also how our skeleton is essential for us to stand and walk around. We have been using some very tricky scientific words and the children have done a very job job remembering them! The dental nurse came to visit and was very impressed with how much the children already knew about looking after their teeth. 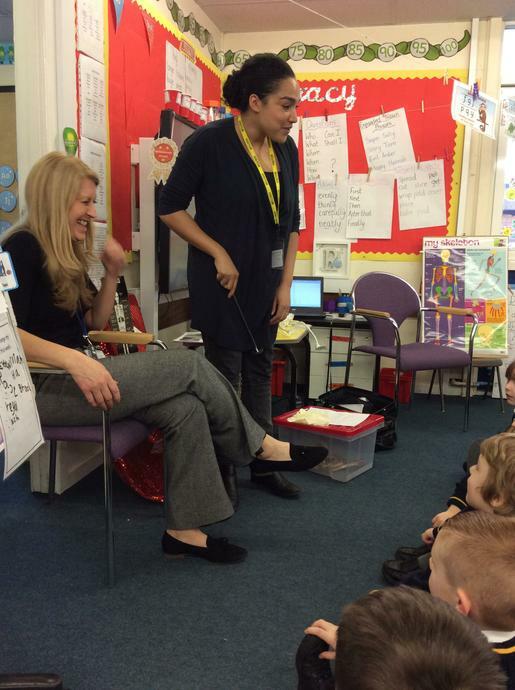 Jack's mummy also visited and told us all about her job as a physiotherapist. Nest week we are looking forward to a visit from Sam's mummy and their new baby as the children will be looking at how we change as we grow up.